Filtered water is provided in each classroom and each child is provided with an individual glass cup with their name on it. These personal cups are put through our sanitizing dishwasher every week. Juice and sugary drinks are not served at school and we asked that these beverages not be included in children’s lunch boxes. Each family pays a low snack fee when they enroll. This fee covers most of the cost of snacks through the year and the organic milk we serve at lunch. Simple, nutritious snacks are provided to the children each morning and afternoon. We are committed to serving healthful foods and use seasonal. local and organic items whenever possible. Our snacks include a whole-wheat grain, a fruit and/or vegetable and a protein such as cheese, legumes, etc. We provide alternative snacks for children with food allergies and dietary restrictions within reason. The Health Department requirements about food service are stringent, and we adhere to their regulations as well. 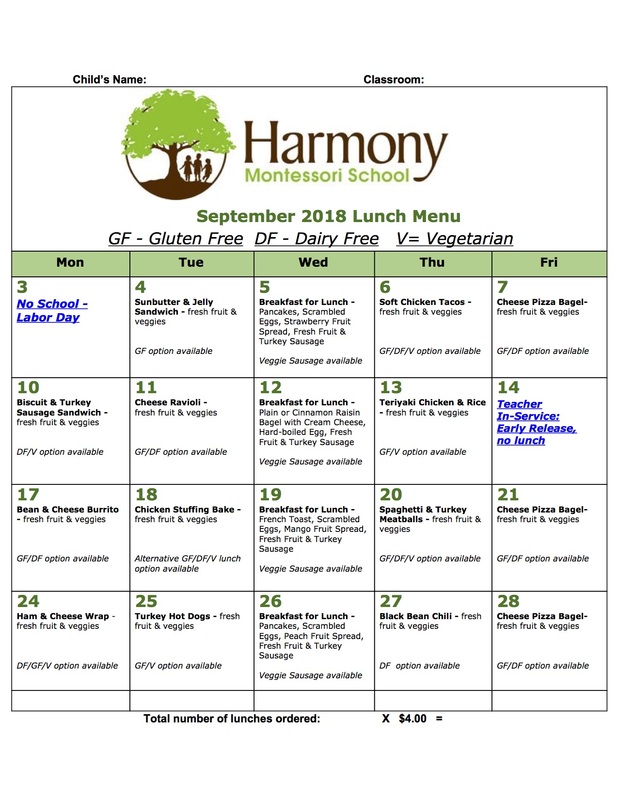 Lunch is a popular, social time for the children but at Harmony Montessori we also cultivate good manners, quiet conversation and careful clean-up. Children eat in their classrooms with their teachers and are provided a full hour of time to eat and clean-up. Porcelain plates and glass drinking cups are provided for each child. Water and Organic 2% milk is served at lunch. You can choose to pack a nutritious balanced meal for your child each day. We ask that you include some complex carbohydrates, a fruit or vegetable and a protein. We ask that chips and crackers be used very little, if at all to ensure your child has enough energy to sustain them throughout the day. To ensure your child’s lunch remains fresh we encourage parents to include a gel ice pack in their lunch to maintain a healthy and safe food temperature. Warm ups can be added once a week to your child’s lunch and may only be heated in a glass container. Hot lunch is also available through purchase. A menu is published two weeks before the start of each month. Parents may choose which days they would like to purchase lunch. Cost for lunch is $4.00 per lunch. Families can pay when they submit their menu or it can be applied to their monthly invoice and billed on the next month’s tuition invoice. We offer gluten free, vegetarian and dairy free options for the same price. Harmony is currently a PEANUT, NUT and SESAME free school. We ask all families to read all labels when providing lunch for their child and not bring in items that contain the above ingredients. We understand and support families and children with special dietary practices or food allergies.